Aircraft Picture - Amiot 123 "Marszałek Piłsudski"
The Amiot 120 was a family of French single-engine biplane bomber aircraft, built by the SECM-Amiot factory in mid-1920s. The only series-built variant was Amiot 122 BP3 medium bomber, other known variant was Amiot 123 long-distance record plane. The aircraft was designed as a medium single-engine biplane bomber. The first of the series was Amiot 120 BN2, 2-seater bomber prototype, powered with Renault 12Ma 580 hp inline engine (registration F-AHCR). It was not ordered by the French Air Force and was built in one unit. More successful was next variant, Amiot 122, of 1927, powered with Lorraine 18Kd 650 hp engine and slightly enlarged. Its initial variant was Amiot 122 BP2 2-seater bomber (registration F-AIUQ), but it entered production as the Amiot 122 BP3 3-seater bomber. There were built 80 aircraft for the French Air Force and 5 for Brazil. Another variant was Amiot 123. It was meant to be a bomber Amiot 123 BP3 (one was built) but the French Air Force showed no interest in it. At that time, Polish authorities were looking for a long-distance record plane for transatlantic flight. 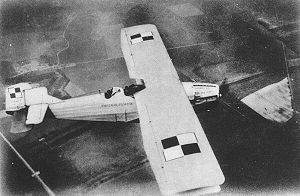 In 1928 and 1929, there were built two modified aircraft Amiot 123 in a long-distance variant, with enlarged fuel tanks (first had Lorraine 18 Kdrs 710 hp engine, the second Lorraine 18 Kdrs 785 hp engine). Last two variants, Amiot 124 BP3 and Amiot 125 BP3 were bombers prototypes of 1931, fitted with Hispano-Suiza 18Sbr 1000 hp and Renault 18Jbr 700 hp engines respectively, not ordered by the French Air Force. Some sources claim, that also prototypes Amiot 121 with Lorraine 18 Kd 650 hp engine and Amiot 126 with Lorraine 18 Gad 700 hp engine were built. Amiot 122 was first used as a long-distance sports plane. From September 13, 1927 the prototype carried out a 10,800 km tour around the Mediterranean Sea, from Paris, through Vienna, Beirut, Cairo, Benghazi, Tunis, Casablanca to Paris. From April 3 to 5, 1928, lieutenant Girardot flew it across the Sahara, on the Paris-Timbuktu-Dakar-Paris 10,100 km route. 80 Amiot 122 BP3s were used by the French Air Force as reconnaissance bombers, starting in 1930. They were used in the 11th Aviation Regiment, based in Metz. They were nicknamed by pilots La Grosse Julie (Big Julie). In 1931, Brazil ordered 5 aircraft (4, according to Brazilian publications). They were used until 1936. One aircraft was used on the government side during a coup d'etat in July 1932. Paul Teste was killed in an Amiot 120 on the 13 June 1925 as he was training for a transatlantic flight. The first Amiot 123 was bought by the Polish Air Force in order for a first westbound transatlantic flight (in some sources, it is designated as Amiot 123.01). It was named Marszałek Piłsudski (Marshal Jx�zef Piłsudski). The crew were pilot Ludwik Idzikowski and navigator Kazimierz Kubala. They commenced their first trial of a transatlantic flight on August 3, 1928, taking off at 4:45 a.m. from Paris Le Bourget airfield. However, after flying some 3200 km away, above the ocean, they noticed lowering oil level in engine, which was caused by a cracked oil tank. They decided to return to Europe, since it was more than a half way to America, against the wind. After 31 hours of flight, when oil in engine ended, Idzikowski decided to land on water, by the German merchant ship Samos, about 70 km away from Spanish coast. The sailors rescued the crew and pulled an aircraft out of water, but it was damaged. Idzikowski and Kubala repeated a trial the next year. The second Amiot 123 was bought, initially built for the French pilot (according to some sources, it was still the first plane). It was named Orzeł Biały (the White Eagle, although according to some sources, it was still Marszałek Piłsudski). They took off on July 13, 1929, at 3:45 a.m. from Le Bourget. After flying 2140 km, over the ocean, about 5 p.m., the engine started to lose rounds per minute, and produce a noise. They decided to land on Faial Island of the Azores. However, because of more irregular engine work, at 9 p.m. (7 p.m. local time), Idzikowski decided to make an emergency landing on a closer rocky island Graciosa. During a landing on a field, the plane hit a low stone wall and overturned wheels up. In a crash, Ludwik Idzikowski was killed, while Kazimierz Kubala was lightly injured. During a rescue action, the aircraft burned. Metal construction biplane, conventional in layout, with braced wings. A fuselage was a frame of duralumin pipes. Engine was covered with duralumin sheets, rest of the plane was covered with canvas. Conventional fixed landing gear, with a rear skid. Crew of three, sitting in tandem in open cockpits. Amiot 120 BN2 : Two-seat light bomber prototype. Amiot 121 : Record breaking aircraft. Amiot 122BP3 : Three-seat medium-bomber aircraft. Amiot 122S : Two-seat record breaking aircraft. Amiot 123 : Two-seat long-range record aircraft. Amiot 124 BP3 : Bomber prototype. Amiot 125 BP3 : Bomber prototype.